See also US economic mobility data and Not (all) in our genes? The juicier part of these apples seems to be the x axis. 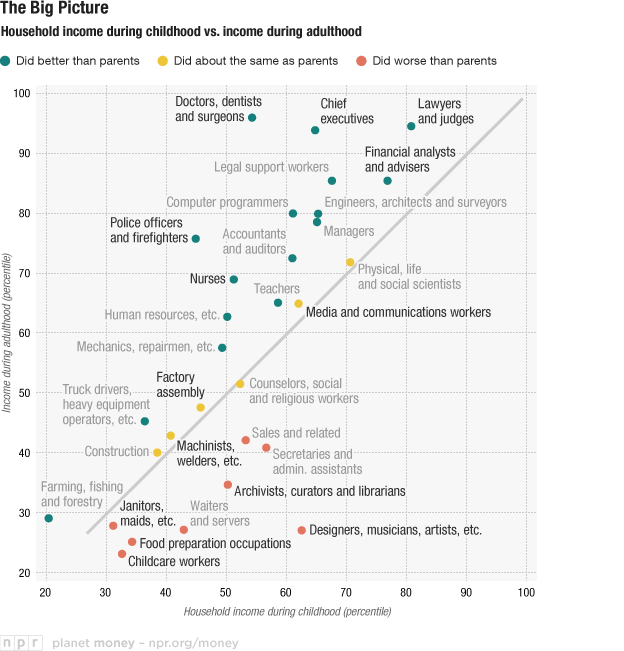 I kinda thought doctors kids tended to be doctors, which would bias their childhood income upward - but no such bias is observed - just a great way for the apple to end up far from the tree. The "first responders" public-sector-union crowd seems to be a great way for the apple to gain distance from the tree as well. Considering that median real wages have stagnated (if not outright declined) in the last two generations I find that scatterplot highly dubious. docs, dents, and surges (http://www.youtube.com/watch?v=GHZWWFmaFcI) at < 100k can't be right. hmmm. ly. a candy apple who fell from a monkey puzzle tree. Yet another shocking study showing the most brilliant in law and finance stay that way or at worst become professionals and scholars, the low-IQ stay that way, and those held back in one generation go forward into the next via e.g. business and the professions. Who knew?